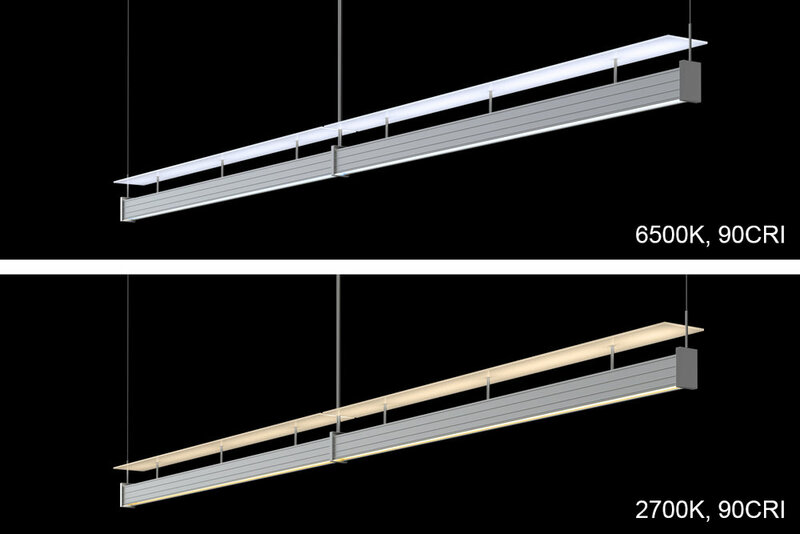 Linear LED collection includes pendants, linear systems, wall and flush mounts for open offices or corporate areas. Vertical and horizontal sconces bring sculptural effects and visual impact to any space. Anodized aluminum extrusion with parabolic interior reflector. Two profiles: X shape and rectangular. The X section gives a broader beam spread and allows for a range of decorative options. Rectangular section for a slender profile and minimal size. Machined aluminum joints and ends. Linear system continuous runs are center fed every 8’ to give even power distribution for consistent light output end to end, no shadows. Single point suspension for an 8ft unit allows for less ceiling disruption. Suspension options and extruded shapes are designed to be architecture on the ceiling. Beautiful when you see them, and are hardly noticeable when not looking for them. Four distinct suspension options set this line apart. 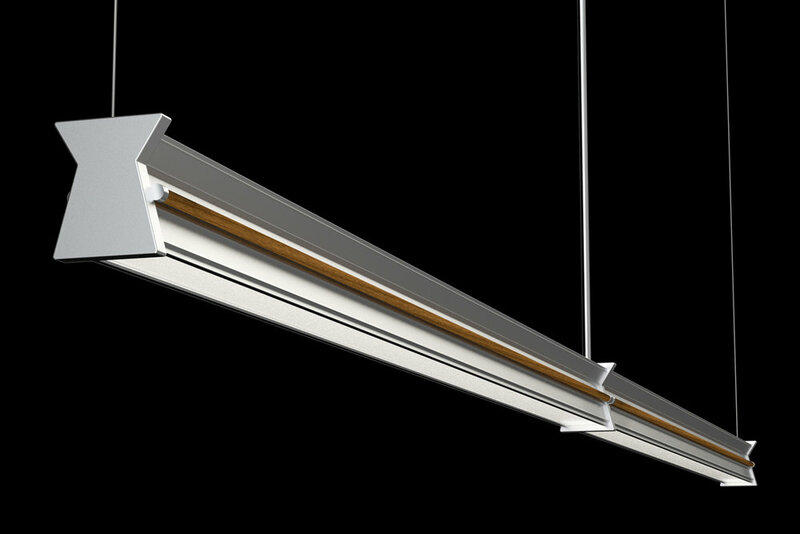 They are spectacular as a stand alone pendant, or in linear system of continuous runs. Stainless steel cable suspension. Field cut tubing with internal suspension cable. A much cleaner look than sloppy cords. Color tuning option has a range of 2700K to 6500K at 90 CRI. It can be programmed for a cooler color temperature in the morning for CS then warmer color in the evening, supporting circadian rhythm. This can give a pleasant feeling, experiencing the beauty of light as it changes throughout the day. Static color temperature in Nikola fixtures can be used to support circadian entrainment. Changes in circadian stimulus values can be achieved by a change of light intensity over time with the same (static) color temperature through dimming. The Nikola standard 3500K* static color temperature LEDs produce enough light and have the proper spectral power distribution (SPD) To support CS. *Based on RPI CS calculator. Cost effective lighting solution. Each Nikola fixture has enough light output to reduce the number of fixtures required in a space by up to 33%, depending on application. This reduces installation and maintenance costs as well. Glass X pattern: wave like up down pattern with side light on frosted panels. Glass flags: visual rhythm and patterns of light. Glass top: white sandblasted reflector produces an ambient light with softened shadows. Glass sides: linear aesthetic and the feel of true glass illumination. Factory programmable driver options are high (standard), medium and low. These adjustments allow for lower wattage/lumen specification when required. 0-10 volt dim to 1% Drivers remote as standard. No driver option available. Flush box housing option: Can be recessed into ceiling or mounted on the surface.